Remember a couple of weeks back when we took a long position here, we quoted management as averring that they “are not expecting that the current financial crisis is likely to dampen demand for electricity in China?” Well…that was then, and this is now. Our Chinese co-generation and windpower play, A-Power Energy Generation Systems, Ltd. (APWR), today announced that they were cutting their 4Q08 guidance for revenues to less than half (from $158 million to $76 million) and for earnings to less than one-third (from $15.5 million to $5 million) the previously announced figures. LOL a good example of the risks of investing in individual stocks: looks as if our purchase at $6.14/share on 18 December was the highest close of the month; the stock opened December at $4.30 and closed at $3.62 on 5 December before rallying to the aforementioned close of $6.14. Since then, it has been mostly downhill; APWR closed at $4.88 yesterday and is down again sharply today on this announcement. Sohu.com derives revenue from consumers and from advertisers. Consumer services include online games, wireless, and a panoply of value-added services such as news, information, music, ringtone and picture content delivered to cell phones. (More Chinese internet consumers access the web via cell phones than computers.) Corporate services consist of brand advertising on their matrix of websites as well as paid listing and bid listing on their search engine. The company operates two massively multi-player online role-playing games (or MMORPG games)—Tian Long Ba Bu (or TLBB) and Blade Online (or BO)—plus a casual game platform. The pricing model for the MMORPG games is different from the standard USA model in that you can play for free…but to progress satisfactorily, you need to acquire virtual objects, which are available for sale from Sohu.com. This is a much more flexible—not to mention, insidious—arrangement than the model that is typical with USA gaming companies, where you need to pay an upfront licensing fee—for downloadable software which you need to install on your computer—and then a monthly subscription fee to afford you access to the game server. Gaming is huge, accounting for 45% of revenues in Sohu.com’s latest quarter (3Q08) as compared to 41% for brand advertising, 14% for wireless services, and 1% for search ads (a weak point). The ash and trash (ringtone downloads and the like) accounts for the other 1%. The company had an IPO on the NASDAQ in July 2000, raising $52 million. Since then, their growth has been pretty much self-funded. The $25 million loss blip in 3Q01 was due to a adjustment of the valuation of goodwill and “identifiable intangibles” in connection with the Chinaren acquisition from the prior year, not any sort of problem with ongoing operations…in other words, a one-time paper loss. They did issue $90 million of notes in 2003, but by the end of 2007, those had all been paid back and the company has no long-term debt and—as of 30 Sep 08—$279 million of cash ($7/share!). 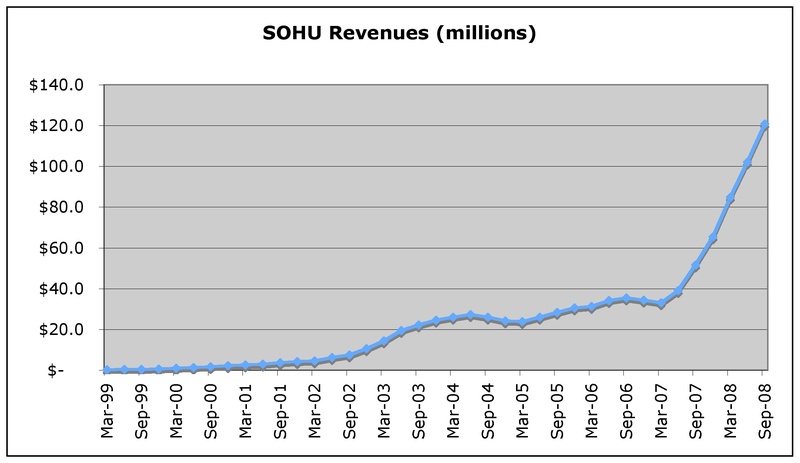 Speaking of share price, the best time to buy Sohu.com was probably September 2002…they turned profitable that quarter for the first time, and the shares were going for $2 each. Of course Intelledgement was not around then. But when we launched in January 2007—and purchased the China equities ETF FXI for the IMSIP—we could (and should) have bought SOHU shares for the ISOP for $20 each. The one remaining question is…why Sohu.com instead of (BIDU)? If Sohu.com is akin to Yahoo! (YHOO) in China, then Baidu—with the leading search engine—is akin to Google (GOOG)…and we all know how that has played out. While we haven’t looked that closely at Baidu, we expect that it is a perfectly legitimate way to play the China growth story, and in the long run, may be an even better choice than Sohu.com. But the latter is not just another Yahoo! Sohu.com derives nearly half their revenue from their online games. Think about a combination of Yahoo! and Activision Blizzard (ATVI), the publisher of the World of Warcraft online gaming franchise. As the number of internet users ramps up in China, the pie is plenty big enough for Sohu.com to prosper, even if Baidu ultimately wins the search engine war decisively. A-Power Energy Generation Systems (APWR) is a Chinese company focused on the distributed power generation market. As fast as China’s economy is growing, there are serious “disturbances in the force” with respect to the reliability—and in some cases, even the availability—or electricity. APWR’s core business is working with companies and local governments to design and build cogeneration and distributed generation facilities. Their systems typically capture waste heat that a factory is already generating and convert it into electricity that the factory can use directly, or which can be sold back into the power grid. This affords the customer electricity that is both reliably available and typically cheaper than power purchased from the grid. China’s demand for energy is ramping up rapidly. The International Energy Agency (IEA) estimates that China’s primary energy demand will increase 3.2% annually from 1,742 million tons of oil equivalent (MTOE) in 2005 to 3,819 MTOE in 2030. Near-term demand is projected to be even higher: 5.1% annual increases through 2015. To meet this demand, the IEA estimates China needs to add more than 1,300 GW to its electricity-generating capacity (more than the total current installed capacity in the USA). In their bid to service this market, APWR come to the table as the only private company currently authorized to contract and build cogeneration and distributed generation projects in China. (There are numerous state-run competitors, but these are generally comparatively expensive and slow-to-deliver.) While this is not an insurmountable moat, while it lasts it does afford APWR an outstanding opportunity to grow quickly and establish themselves in this huge market. And, the company is profitable, and has been for several years. They produced $18.5 million of black ink in the first nine months of 2008, up 56% from the $11.8 million of profits for the first nine months of 2007. They anticipate a big fourth quarter and are guiding for $35 million or higher in profits for the year, and are not expecting that the current financial crisis is likely to dampen demand for electricity in China. That may or may not turn out to be true, but for sure yesterday’s close of $5.09 is already calamitously down from six months ago, when the stock was north of $30/share. With a P/E of around 18 here, the stock may not be breathtakingly cheap, but as a profitable company with superb growth prospects, it looks like a reasonable bargain. But wait…there’s more. Last year, the company decided to enter the wind power market and announced the construction of a wind turbine factory in Shenyang. This facility will include two production lines with an output capacity of 300 units/year of 2.7MW wind turbines and 420 units of 750kW wind turbines, totaling over 1.1GW in annual output. They plan to use components the company has secured from Fuhrlander AG and other European wind power component suppliers, and their European suppliers are helping them set up the factory. And APWR hit the ground running in the wind power market. In 1Q08, they announced letters of intent with various potential customers amounting to over 300 turbine units. In 2Q08, they executed their first contracted sale, of five 2.7MW units to the China National Automation Control System Corp. (CACS). Then in October, they announced a followup sale of 50 more 2.7MW units to CACS (which sale was not from among their 300+ LOI units). According to Shenghang Wang, CACS General Manager, “We look forward to our expanded relationship with A-Power. Their 2.7MW wind turbine has already been market tested by Fuhrlander in Europe and is currently the largest land-based wind turbine that is commercially available to us in China. These large turbines will help us achieve a greater amount of wind energy output in each of our new wind farms in Gansu and Inner Mongolia.” The first turbine units are expected to be delivered in July 2009. APWR is listed on NASDAQ as of earlier this year—Lu rang the opening bell on 16 April—and is included in the Russell Global Index. The company has no debt, and a strong cash position. There are fewer than 34 million shares outstanding of which management own about 13 million. Unlike our “big brother” IMSIP portfolio—which is long FXI—the ISOP has been lacking direct exposure to the Chinese buildout. Our purchase of APWR today (along with SOHU) corrects that imbalance. As we stated in our IMSIP post announcing we are selling off the financials and real estate reverse ETFs, we still think the odds favor a long and deep recession and a secular decline here. But for now, we can’t fight city hall. The Fed and the Treasury are firing all the guns at once here, and the combination of today’s shock and awe decision to reduce the discount rate to 0%—free money for the banks!—and purchase mortgage-backed securities combined with the promise of a massive stimulus package to be named later by the incoming Obama administration has broken the gloom-and-doom psychology of the market. We will go up here so long as folks believe Obama can plug the holes in the dyke. He can’t and he shouldn’t be trying, but he is and it could take a while for everyone to realize that resistance to the laws of economics is futile. Sooner or later, that will happen and when it does, we likely be looking to short something in the real estate-related sector again. OK, as we stated in our IMSIP post announcing we are selling off the financials and real estate reverse ETFs, we still think the odds favor a long and deep recession and a secular decline here. But for now, we can’t fight city hall. The Fed and the Treasury are firing all the guns at once here, and the combination of today’s shock and awe decision to reduce the discount rate to 0%—free money for the banks!—and purchase mortgage-backed securities combined with the promise of a massive stimulus package to be named later by the incoming Obama administration has broken the gloom-and-doom psychology of the market. We will go up here so long as folks believe Obama can plug the holes in the dyke. He can’t and he shouldn’t be trying, but he is and it could take a while for everyone to realize that resistance to the laws of economics is futile. Sooner or later, that will happen and when it does, we will go short again. OK, we still think the odds favor a long and deep recession and a secular decline here. But for now, “obtimism”—the optimistic expectation that some combination of the TARP funding from Treasury, intervention by the Fed such as today’s decisions to cut the interest rate on Fed funds to zero and to buy mortgage-backed securities, and the forthcoming stimulus package from the incoming Obama administration will turn things around in the latter half of 2009 and by 2010 we will be back to normal—obtimism reigns supreme. The problem with obtimism is…well, actually, there are several problems. However, none of them speak to why we are stepping aside on these short positions today in the wake of the Fed’s latest attempt to sweep back the tide. Like most investors, we have been singed by the fires of 2008, and we are closing these short positions today not because we believe the fires are out, but because this deluge of credit is likely to have an ameliorative effect in the short run, and thus we expect an upward bias in the market until it becomes clearer that obtimism is misplaced. We expect to be back here, probably as soon as next month, probably at better prices. Notes: The benchmark for the ISOP is the Greenwich Alternative Investments Global Hedge Fund Index, which historically (1988 to 2007 inclusively) provides a CAGR of around 15.1%. For comparison’s sake, we also show the NASDAQ index, which over the same time frame has yielded a CAGR of around 10.1%. Note that for the portfolio, dividends are added back into the value of the pertinent security—or subtracted from the value of short positions—and not included in the “cash” total (this gives a more complete picture of the ROI for dividend-paying securities). Also, the “Cost” figures include a standard $8 commission and there is a 2% rate of interest on the listed cash balance. Transactions: Another crazy month in which the ISOP was a haven of sanity. Volatility was extremely high—seven trading sessions in which the NASDAQ finished up or down between 5% and 7%—but it was a bit less wild than October (when there were two days the market moved 10% or more and a third day it moved 9%). Meanwhile we stood pat…hmmm…perhaps when everyone around you is frenetically dashing about like a chicken with it’s head cut off, standing pat is no longer a reliable indication of sanity. Comments: If anyone was still thinking that “change we can believe in” would be any different from frontrunning for the-powers-that-be, it only took Barack Obama 20 days to put that concern to rest. The appointment of Timothy Geithner—one of the architects of the bailout under Bush aegis—is a clear signal. The import is that the new administration will be working just as assiduously as the old one—di rigueur objections from right-wing zealots that the agenda is focused on promoting socialist/statist solutions notwithstanding—to commit taxpayer money in support of the cabal of financial services leaches who crashed the system. Instead of cutting those bad boys loose and blaming the consequent chaos on W—which would have meant taking a lot of immediate pain, but also purged of the poison, a swift and healthy recovery by the economy—the Obama folks have evidently decided to take the path of least resistance and continue the policies of papering over the cracks in the walls. We can look forward to more easy credit, more bailouts of “too-big-to-fail” companies, more Keynesian stimulus, and—if this “works”—a Potemkin-village “recovery” just in time to support Democrats in the 2010 election. Although the odds are improving, it is still not clear if the man behind the curtain can pull off the illusion that all is well again here or not. Reflecting the consequent uncertainty, the level of volatility this month was again—as in October—extremely high: an average daily change of ±3.8% as compared with the normal index change (up or down) an average of about 0.5% each day. At the end of the month, we were +3%, the hedgies were -2%, and the NASDAQ was -11%. Another great month for the good guys! Overall after 23 months of operations, the ISOP is now +155% compared with -7% for the hedgies and -36% for the NASDAQ. It was another heavy news month. Of our four retailers, two were flat and two were down big. Unfortunately, while we are short three of the four, the one we are long, CAB, was one of the ones down big (-21%) after reporting good 3Q08 results but providing very guarded guidance going forward. We still think CAB will shine for us in the long run. BBY was down 23%, MA was down 2%, and WMT was +0.13%, the only stock in the port to be up on the month. All four of our financial services shorts obligingly tanked: BAC -33%, GS and WFC each -15%, and HBC -8%. We did have a pang of regret over WFC’s victory over Citigroup (C) in the bidding to acquire Wachovia (WB) last month; had C won the bid, we most likely would have shorted their stock instead (we had previously been short WB) and they were down 39% this month. Actually, they were down 72% on 21 November before being bailed out by Treasury in yet another egregious misappropriation of taxpayer money. The next day—as referenced above—the Fed committed another $800 billion to bail out Fannie (FNM) and Freddie (FRE). None of our other long positions had a good month. Golden Star (GSS) reported their worst-ever gold production costs and our patience with management is growing very thin; the stock was down another 17%. Neurocrine Biosciences (NBIX) tried making no news and that worked even less well, with their stock down 24%. We still think we need to give their GnRH antagonist candidate drug for fighting endometriosis, elagolix, more time. Vertex (VRTX) went to the other extreme of issuing good news—fresh positive results for their telaprevir anti-hepatitis C drug candidate—but ultimately, it did not save them from a drubbing late in the month over fears the Obama administration will limit the prices of new drugs. These concerns may be justified in the fullness of time, but are unlikely to be an issue for telaprevir in any case, as curing many otherwise uncurable patients of hepatitis C is extremely cost-effective (in that the cost of treating advanced cases of hepatitis C far exceeds the cost of telaprevir). Finally, our oil short ETF, DUG, continues to disappoint, down 18% on the month despite a decline in the price of oil. The risk of a serious downturn continues to be significant here, and consequently we remain net short. However, it does appear that the new administration is angling to establish continuity with the old one with respect to the policy of material intervention in the market to prop up insolvent “too-big-to-fail” enterprises. While we feel these policies are long-term disastrous, there is some “upside risk” should the collective wisdom of the market come to think otherwise. Generally, new political leaders get some benefit of the doubt. So far the the market has not rallied in reaction to the election results (except for the five days leading into the election), but it could still happen. Wow—getting to be wooden stake time here for the (former) bloodsucking residential real estate development company we have sold short, Beazer Homes (BZH). They announced their 4Q08 and full year 2008 results today (their fiscal year ends 30 Sep), and even considering the current meltdown, the numbers were stunningly bad. Revenue in 4Q08 was down 35% from 4Q07 and closings were down 38%. The company lost a record $475 million in the quarter—their eighth consecutive quarter of red ink—up from $155 million of losses a year ago and sharply worse than the $110 million they lost in 3Q08. For the full year, the results were similar: revenue was down 40% from 2007, closings down 35%, and the loss of $951 million (-$24.68 per share!) easily lapped the 2007 loss of $410 million—in fact, Beazer lost more money in 4Q08 than in all of 2007. The cumulative loss for 2007 and 2008 has reached -$1.4B. The stock closed at $1.38, down 9% on heavy volume, after trading as low as $1.21. You have to wonder how long a company worth $1.38/share can afford to keep losing $4.43/share each quarter (as they have on average for the last eight quarters). Things have gotten so bad that earlier today Jim Cramer publically called for Beazer to go out of business. It’s tempting to keep riding this to the end in the interests of science, but the stock price is low enough here that we have to consider just booking our profit. Stay tuned.